"What if we flip the funnel and turn it into a megaphone? What if you could figure out how to use the Internet to empower the people who like you, who respect you, who have a vested interest in your success? I call this group of people—your friends and prospects and customers who are willing to do this—your fan club.—"Turn strangers into friends. Turn friends into customers. And then… do the most important job: Turn your customers into salespeople." Download the electronic version of Flipping the Funnel eBook free of charge. Traditional advertising players – broadcasters, distributors and advertising agencies – will need innovative new approaches to respond to major industry shifts underway. The next 5 years will hold more change for the advertising industry than the previous 50 did. Increasingly empowered consumers, more self-reliant advertisers and ever-evolving technologies are redefining how advertising is sold, created, consumed and tracked. Imagine an advertising world where… spending on interactive, one-to-one advertising formats surpasses traditional, one-to-many advertising vehicles, and a significant share of ad space is sold through auctions and exchanges. Advertisers know who viewed and acted on an ad, and pay based on real impact rather than estimated "impressions." Consumers self-select which ads they watch and share preferred ads with peers. User-generated advertising is as prevalent (and appealing) as agency-created spots. Download the electronic version of Business Value Study free of charge. Download the electronic version of Agency Family Trees free of charge. 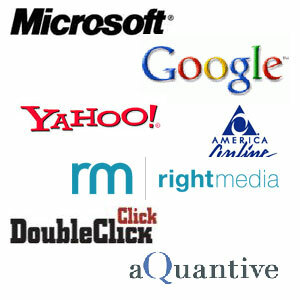 Google acquiring Doubleclick, Microsoft acquiring aQuantive, WPP acquiring 24/7 RealMedia and AOL acquiring AdTech AG to go along with what they already own in Advertising.com. 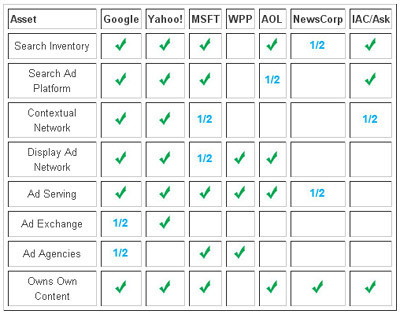 "Exchanges could eventually handle 50% of all display ad sales." "The underlying assumption to that is you’re buying a commoditized product that anyone can sell you." After the acquisitions are all complete, we need to stack up all the areas that matter in the online advertising battle that’s taking shape. (A checkmark means they have an asset, the 1/2 means they do to some extent but not to the same level as the other companies). Spot Runner’s online system is changing the way advertisers are thinking about creating, planning and buying all forms of media from local television to online search. Bant Breen interviews Andrew Bloom of Spot Runner about the company’s services and direction. It is only a matter of time until nearly all advertisements around the world are digital. The plan is to build a global digital ad network that uses offshore labor to create thousands of versions of ads. 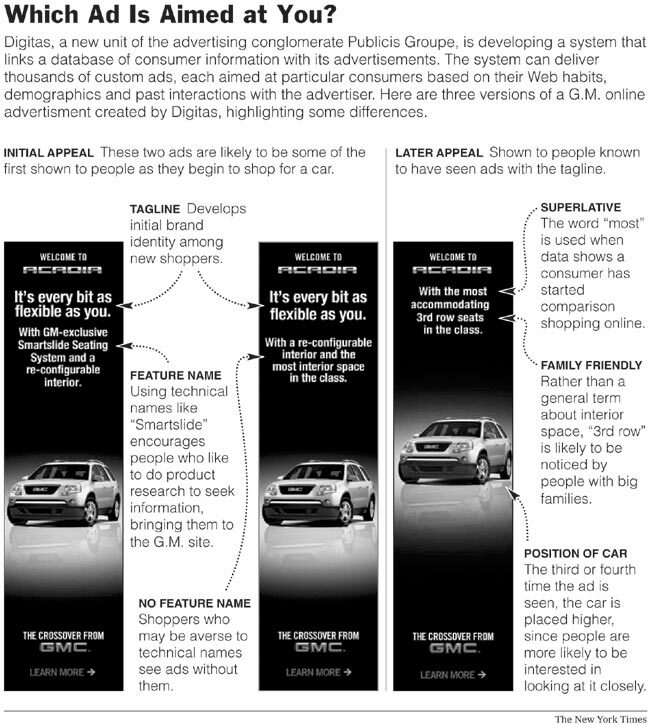 Then, using data about consumers and computer algorithms, the network will decide which advertising message to show at which moment to every person who turns on a computer, cellphone or — eventually — a television. More simply put, the goal is to transform advertising from mass messages and 30-second commercials that people chat about around the water cooler into personalized messages for each potential customer. Greater production capacity is needed, Mr. Kenny says, to make enough clips to be able to move away from mass advertising to personalized ads. He estimates that in the United States, some companies are already running about 4,000 versions of an ad for a single brand. Publicis is trying to carve out a niche as a middleman between those online giants and the consumer brand companies that buy advertising. As the Internet emerged, Digitas developed a platform it calls Dashboards to break online ads into their components and figure out which pieces work for which audiences. Going beyond traditional focus groups and consumer surveys, market research will embrace scientific approaches that literally tap consumers’ brains to learn how they neurologically respond to commercial messages and make brand choices. The Four A’s and ARF have begun researching this topic in earnest with an intensive study, "On the Road to a New Effectiveness Model." In 2008 we will start to see practical applications of these insights as advertisers and shops begin to truly understand engagement. A new report by The Advertising Research Foundation (ARF) should cause all of us in branding, advertising and marketing to stop, question and re-evaluate the way we see our world. The report is titled, “On the Road to a New Effectiveness Model.” No, it isn’t a revision of the Kerouac novel. But it is no less radical. The report summarizes fi ndings from a three-year taskforce looking at the underlying principles and theoretical constructs of advertising effectiveness. We actively participated in the taskforce during that time and agree with the conclusions and implications, particularly the statement, “The fi ndings of this project require us to completely rethink how advertising works.” And rethinking advertising isn’t even the half of it. The findings shake the very bedrock upon which advertising, branding and marketing as a whole are built. The findings indicate that “brand positioning” is perhaps the most misguided marketing idea in the past 30 years. Download the electronic version of this response free of charge.